Two words can add multiple zeroes: low volume. Porsche built just 337 examples of the 959 in the late 1980s, making it a collector’s car from the moment it rolled off the assembly lines. It didn’t help that the car was an engineering marvel and way ahead of it’s time. Now one is up for sale. Despite the many virtues of the 959, its rarity still definitely helps its selling price. This one is being offered by an automotive broker for $1,300,000. That price seems to be inline with what you’ll find if you check around the Internet. There aren’t a lot of 959 transactions, but they’re all typically seven-figure events. This specific car is a 1987 model year car, which was produced in the 959 Komfort spec. The silver paint is a perfect Porsche color and its offset rather nicely by the multi-colored interior display. Originally sold to a buyer in Japan, the car was brought to the U.S. where it was sent to the 959 experts at Canepa. There, the suspension was swapped over from Komfort to the adjustable Sport setup. 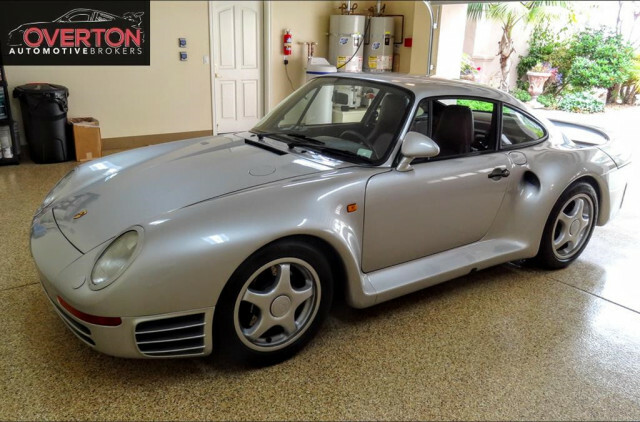 The listed mileage on this 959 is 3,500 per the Overton Automotive Brokers handling the sale. It’s complete with all of its books, manuals, and maintenance records. While $1,300,000 for an “old Porsche” is a lot of money, this seems like a far more interesting garage mate compared to the newer 918.